3.0 liter turbo V6 producing 330 hp and 331 lb.- ft.
“That’s the way we’ve always done it.” Not really a sentence to inspire change. Except at Porsche. That’s because we’ve always made each new generation of engines higher-performing, more dynamic and more efficient than the last. The new engine generation of the Panamera models now takes the next significant step forwards. The all-new twin-turbo V6 engine in the Panamera 4S is lighter and more compact than its predecessor and comes equipped with VarioCam Plus. The two turbochargers are now positioned in between the cylinder banks. This reduces the distance that the exhaust stream has to travel to reach the respective turbo – delivering a more rapid response. The direct fuel injection in the new generation of engines is realised by a central injector inside the combustion chamber. This optimises both the mixture injection and combustion – for greater efficiency and increased power delivery. All Panamera models are equipped with Porsche Traction Management (PTM). This active all-wheel drive with electronic and map-controlled multi-plate clutch ensures the optimum distribution of drive force whatever the driving situation – for excellent acceleration power on long straights, through tight corners and on road surfaces with varying grip. 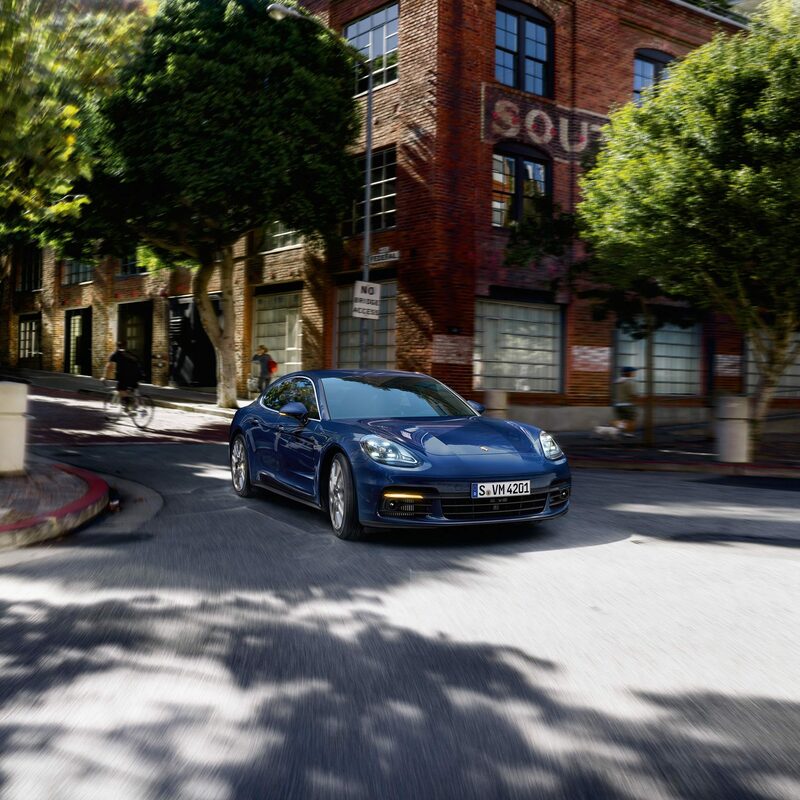 Whether you’re behind the wheel or occupying a passenger seat in the front or rear: in a Porsche, every drive should feel like sport, not transport. The chassis of the new Panamera models performs this balancing act between sport and comfort effortlessly – and in the most masterful way possible: with further-developed, optional chassis technologies. Examples include the adaptive air suspension with three-chamber technology boasting a 60 % greater air capacity than that of the predecessor, new Porsche Dynamic Chassis Control Sport (PDCC Sport) and rear-axle steering. What’s also new is the integrated Porsche 4D Chassis Control system, which centrally analyses the driving situation in all three spatial dimensions, e.g. pitch, roll and yaw, computes optimum driving states from these data, and synchronizes all chassis systems in real time: the fourth dimension. The objective is to optimize overall performance, and to make the middle ground between sporty driving and comfort as expansive as possible. During low-speed maneuvers, the system steers the rear wheels in the opposite direction to that of the front wheels. This has the virtual effect of shortening the wheelbase. The turning circle is reduced, agility is increased and parking becomes noticeably easier to manage. During high-speed maneuvers, the system steers the rear wheels in the same direction as that of the front wheels. This virtual extension of the wheelbase increases driving stability. Rear-axle steering makes it clear that there is no contradiction between stability and agility or performance and everyday driveability. The result: greater maneuverability and driving safety in everyday use – and a significant increase in maximum driving performance. New Porsche Dynamic Chassis Control Sport (PDCC Sport) is an active roll stabilization system with an ultra sporty setup. It registers the lateral inclination of the body induced by cornering from the very outset and acts to suppress it. The system also reduces the lateral instability of the vehicle on uneven ground. The overall result? Strong resistance to destabilization side forces for self-assured poise. Excellent traction. Great agility at every speed – with precise turn-in and well-balanced load transfer characteristics. And, accordingly, even more fun in the corners. We rise to the challenge we’re given. The same applies to the wheel dimensions of the new Panamera. The tires are wider, the contact surface larger – for enhanced performance under acceleration and braking. As of now, optional sizes of up to 21 inches are available from a range of wheel designs, assuring you of a grand appearance. 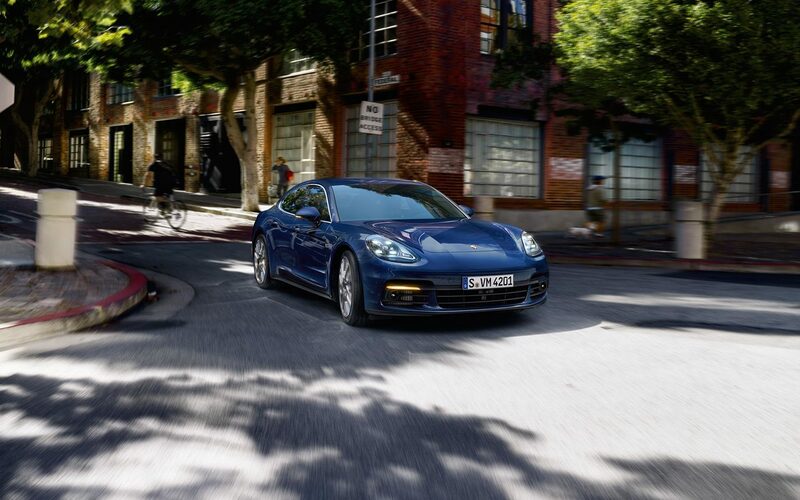 The Panamera models are equipped as standard with 19-inch wheels. The material? Alloy, of course. The design? Classic and sporty. A choice of other 19-, 20- and 21-inch wheels is available on request. Adrenaline at the push of a button: the Sport Chrono Package offers an even sportier tuning of the chassis, engine and transmission. The kit includes a digital and analog stopwatch, a graphic in the instrument cluster showing longitudinal and lateral acceleration, and a performance display for viewing lap times in Porsche Communication Management (PCM). What’s new is the mode switch on the steering wheel with SPORT Response button, derived from the 918 Spyder. Four driving modes are available to choose from: ‘Normal’, ‘SPORT’, ‘SPORT PLUS’ and ‘Individual’ – for an even more personalized driving style. Pressing the button in the center of the mode switch primes the engine and transmission for the fastest possible unleashing of power (e.g. for overtaking). A few years ago, everything to do with the sedan suddenly changed. Large, cumbersome and thickly padded instantly seemed outmoded qualities. On the road, something happened – something rather fast and dynamic: a sports car came along. A sports car with four seats, an unmistakable silhouette and performance figures normally associated only with a Porsche. The Panamera. It changed everything. For drivers of sedans first and foremost. Sporting spirit – in business and in personal life – found its automotive counterpart. The courage to perform found a matching performer. 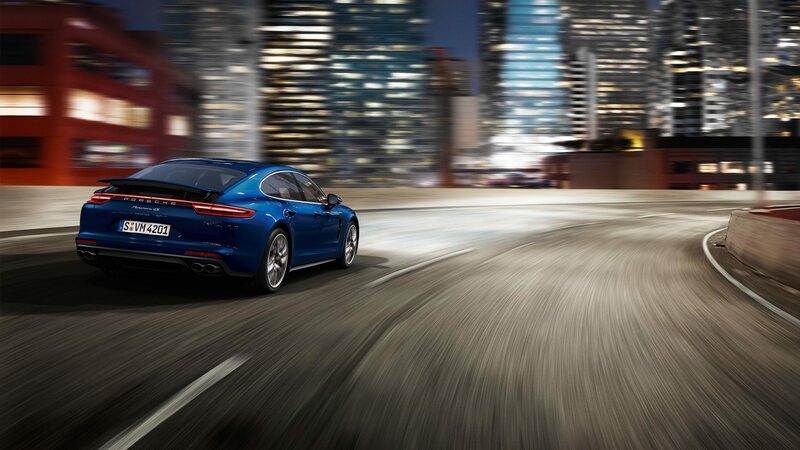 Our engineers have demonstrated their courage with the Panamera concept. By continually re-evaluating and reinventing. By reconciling apparent contradictions: performance and comfort, dynamics and efficiency, career and family. And by forever remaining true to our roots, with shared traits like the ignition on the left and the tachometer in the middle – in short: typical Porsche DNA. The result? Singularity. Of the Porsche kind. New Porsche InnoDrive and other innovative assistance systems make driving not only safer, more efficient and more relaxing – but also more enthralling. Typically Porsche. 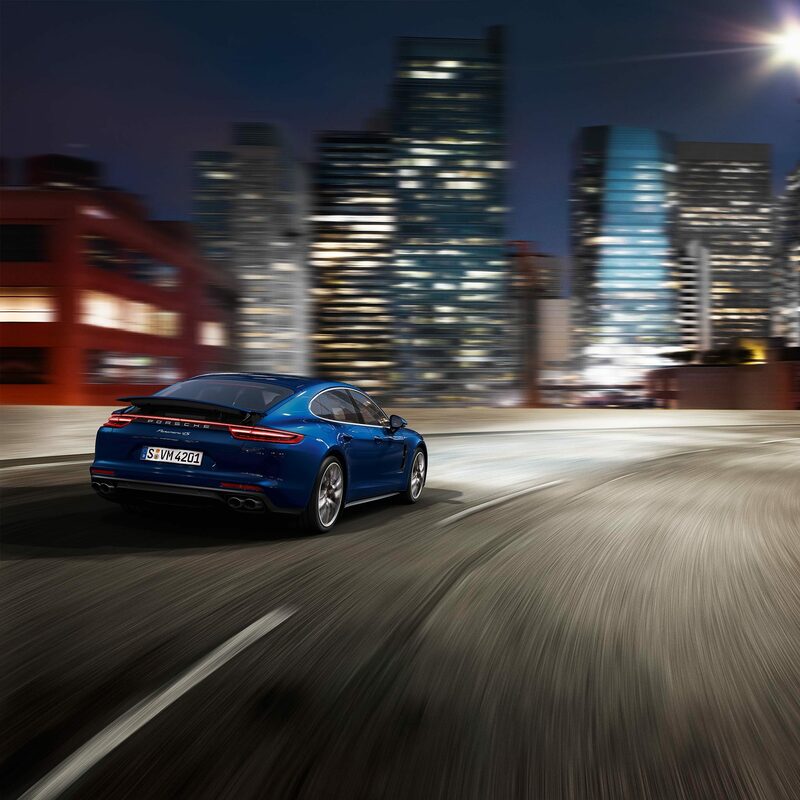 And it’s more dynamic than ever: thanks to Porsche Dynamic Chassis Control Sport (PDCC Sport), Porsche 4D Chassis Control, three-chamber air suspension and – for the first time in the Panamera – rear-axle steering. And because a Porsche is always heading in the direction of the future, the new Panamera models are fully digitally networked thanks to Porsche Connect. The new Panamera Executive models combine sporty driving with a comfortable work zone in the rear compartment – thanks to an extra 15 cm added to the length of the body, which benefits the rear passengers the most. Visual hallmarks of the Executive models are silver-coloured elements in the slats of the front air intakes and above the sideskirts. The air outlet trims in the front wings are in silver colour with a high-gloss finish. The standard specification includes adaptive air suspension, a panoramic sunroof, side airbags in the rear compartment and a rear roll-up sunblind. Particularly pleasant: power seats in the rear compartment with seat heating and comfort headrests. 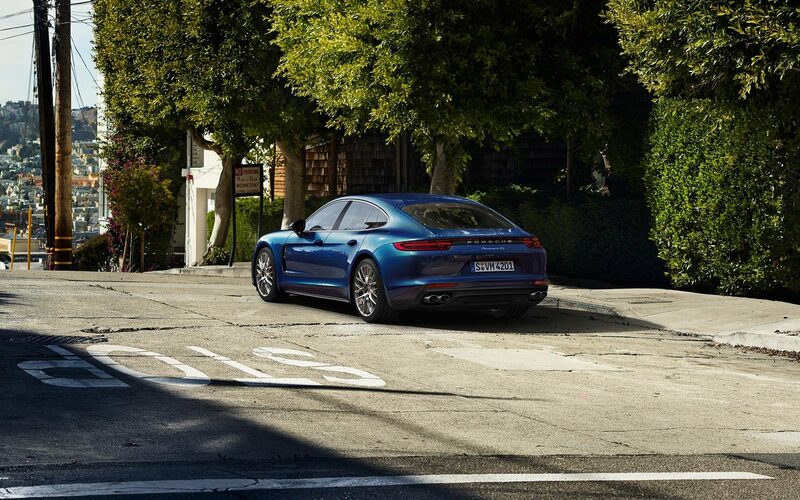 Panamera 4S Executive and Turbo Executive models are additionally equipped with rear-axle steering, ParkAssist including reversing camera and soft-close doors. 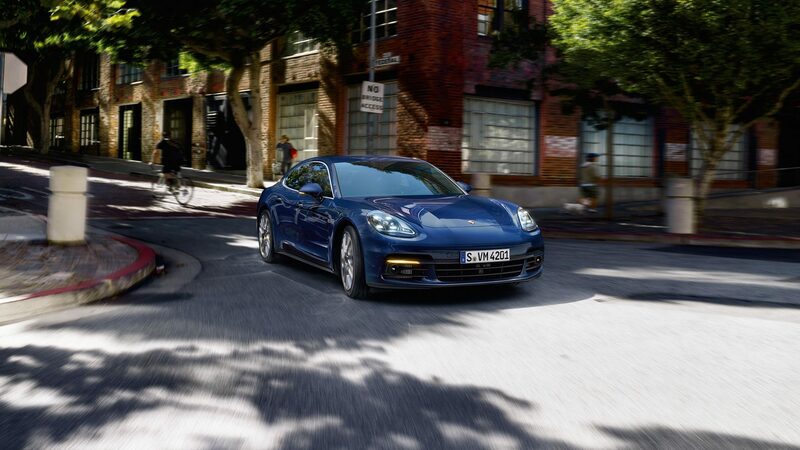 Standard in the Panamera Turbo Executive: four-zone air conditioning system. 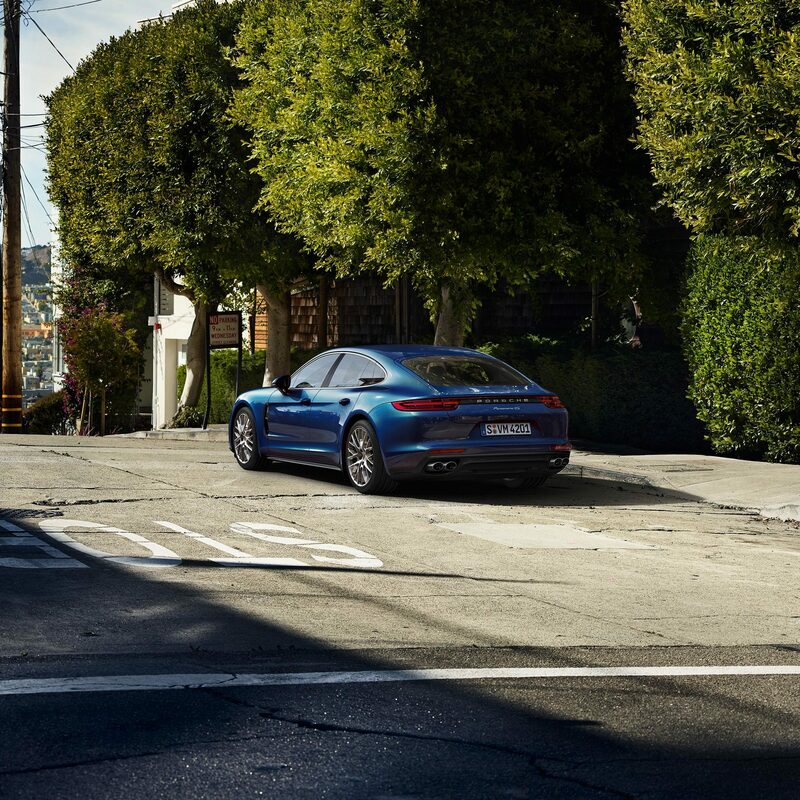 The silhouette and proportions of the new Panamera models are more Porsche than ever. Clearly perceived rounded transitions, powerful muscles and a sharpened sports car silhouette emphasize the precision of the new design. The wheelbase is 1.2 in. longer than that of the predecessor – the shorter overhang at the front and the longer overhang at the rear lend visual dynamism. The more prominent sculpting of the side creates the customary Porsche waistline and sense of lightness. The interior has been completely restyled – and nevertheless remains typically Porsche. The center console ascends towards the front. The dashboard is flat and conspicuously wide. The analog rev counter is positioned in the middle of the instrument cluster. For over 60 years, we’ve been working on being faster. Even when it comes to slowing down. That’s why the new Panamera models are equipped with a brake system having six-piston aluminium monobloc fixed brake calipers at the front and four-piston equivalents at the rear. The brake discs are internally vented and slotted. This improves braking behavior even under extreme conditions and heat is dissipated more effectively. The one-piece brake calipers have an enclosed construction. This makes them lighter yet highly resistant to deformation. Pedal travel is tight, the pressure point precise, the braking distance impressively short. Available as an option for all Panamera models, fitted as standard to the Panamera Turbo: LED headlights including Porsche Dynamic Light System (PDLS) with dynamic range adjustment, dynamic cornering lights and speedsensitive headlight range control. For enhanced near-field, lateral and far-field illumination – and added safety. Even greater foresight is achieved with LED featuring matrix technology. LED matrix headlights including PDLS Plus : bright, homogeneous, safe. PDLS Plus, which includes all the functions of PDLS, now comes for the first time with electronic cornering lights. Night View provides the driver with information even beyond the range of the headlights. An infrared camera detects pedestrians or large wildlife before they are illuminated by the headlights. A thermal image in the instrument cluster warns the driver: the detected person or animal is highlighted in yellow – or in red and accompanied by an audible signal if within the critical range in front of the vehicle. 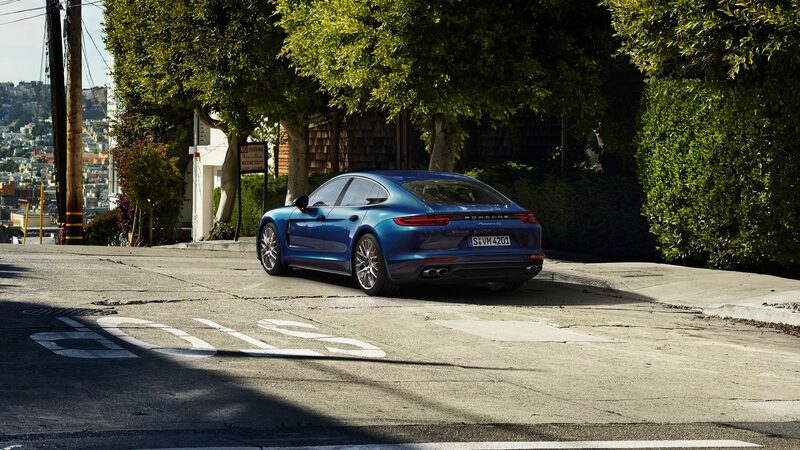 This system regulates the speed of your Panamera fully independently in line with the speed of the vehicle in front. Radar sensors on the front end scan the road ahead. Let’s imagine you’ve selected a cruising speed but have begun to gain on the vehicle in front because it is driving more slowly – the system reduces the speed of your vehicle by restricting throttle or gently applying the brakes until your chosen distance from the vehicle in front is restored. Implemented for the first time at Porsche in the Panamera, the system uses the knowledge gained from its prediction horizon of up to 1.8 miles to formulate the optimum timing for acceleration, constant speed driving and deceleration phases to provide a harmonious driving experience. Imagine, for example, that a speed restriction is in force further along the route but the traffic sign is not yet in sight of the driver: the system already knows that deceleration will be required and initiates a fuel-saving coasting maneuver. Porsche InnoDrive represents the typically Porsche realization of efficient driving – for greater comfort and greater driving pleasure. Another feature of Porsche InnoDrive including adaptive cruise control is Traffic Jam Assist. It eases the burden on the driver when congestion is encountered on major highways. At speeds of up to approximately 37 mph, the system uses gentle steering inputs to keep the vehicle in the middle of the lane, regulates the distance from vehicles in front and follows the queue ahead where system limitations allow. To do this, Traffic Jam Assist tracks roadway signs and other vehicles on the road. The benefit? Appreciable stress relief and greater comfort on long drives. Lane Change Assist uses radar sensors to monitor the areas to the rear of the vehicle and the blind spots on either side. As you move to change lane, the system issues a visual warning signal in the exterior mirrors if another vehicle is rapidly approaching your vehicle from behind or is residing in one of your blind spots. The function can be activated in PCM as required. During low-speed turns, new Turn Assist improves safety at the rear. When approaching an intersection, Turn Assist issues a visual warning if it detects objects approaching in the blind spots behind your vehicle. Lane Keep Assist is a camera-based system for automatic detection of divider line markings on the road. The system eases the burden on the driver by providing steering assistance, helping to keep the vehicle in lane. Integrated traffic sign recognition uses a camera and navigation data to detect speed limits and ‘no passing’ zones. Information is displayed in the instrument cluster. The advantage over information stored in the navigation database is that even temporary speed restrictions can be detected. New for Porsche is the corner notification, an enhancement to the traffic sign recognition function. Based on navigation system data and camera recognition of cornering road signs, the system displays an arrowed direction warning on the instrument cluster display alerting you to tight corners. Long before you reach them. The reversing camera facilitates precise reverse parking and maneuvering. Help is provided in the form of the camera image and the dynamic, superimposed guidelines on the PCM screen, which illustrate the predicted course of the vehicle given the current position of the steering wheel. Sporty, for an outing on the racetrack. Comfortable, for a long journey in a party of four. There is no ‘either–or’. That’s the Panamera. Its ingenious sports car ergonomics are centered on the driver and on performance – without disregard for the well-being of passengers. Let’s give you some examples. Ascending center console: enabling quick hand movements from the steering wheel to the gear selector. New control and display concept: Porsche Advanced Cockpit with newly styled centre console in glass look and touch-sensitive buttons arranged in logical groups. High-resolution 12-inch touchscreen display. Instrument cluster with analog tachometer positioned in the middle, flanked on the left and right by two high-resolution displays. Multifunction sports steering wheel. And what else? You decide: seat variants, leather or two-tone interior schemes? Fine woods, aluminium or carbon? More sporty? More luxurious? Both? Thanks to our extensive range of personalization options, the possibilities for you and your wishes are virtually boundless. Optional ambient lighting with rear interior lighting is an indirect lighting concept designed to enhance passenger comfort. You can choose from seven lighting colors and customize their intensity. Analog meets digital: the new instrument cluster of the Panamera models is reminiscent of Porsche motorsport history – and, at the same time, it is as modern as only it can be. In the middle and in direct view of the driver is the analog tachometer, its needle integral to its truly classic design. To the left and right, two high-resolution displays provide you with a variety of information as and when you need it, such as the navigation map or Night Vision Assist. On the left-hand side of the tachometer is the speedometer. In its center, you can see data relating to adaptive cruise control, for example. In the display field on the outer left, you can choose to show the speed limit indicator, traffic sign recognition or the external temperature. Available as an option, adaptive sport seats (18-way, electric) including memory package provide even better lateral support – thanks to the elevated side bolsters on the seat squab and backrest. Electrically adjustable, they offer comfort on long journeys and made-to-measure lateral support in the corners. The most striking feature of the rear seats? There are two separate ones. With plenty of leg- and headroom and offering excellent lateral support through fast corners without sacrificing comfort. Eight-way power seats are available as an option for the rear in any Panamera model. In addition to the electric backrest adjustment, seat squab length adjustment and lumbar support, there is a facility to adjust the front passenger seat from the rear compartment (depending on equipment specification). In conjunction with adaptive sport seats in the front, sport seats featuring elevated side bolsters are also fitted in the rear. On request, the power seats are also available with a massage function – front and rear. With five programs and five intensity levels to choose from, 10 air cushions in each backrest provide a relaxing treat for the back muscles. For improved seating and long-distance comfort. An active carbon filter traps particles, pollen and odors and thoroughly filters fine dust out of the outside air before it can reach the interior. A new ionization function is available as an option – for improved air stream quality. Before it reaches the cabin, the air in the automatic climate control system is passed through an ionizer. Airborne viruses, bacteria and spores are reduced and the interior air is appreciably refreshed for an even more pleasant cabin environment. Quiet, please, as we introduce a total output of 1,455 watts, 21 individually controlled loudspeakers including an active subwoofer with 400-watt class D digital amplifier, two-way center system and a total diaphragm surface area of more than 2,500 cm². Ribbon tweeters have been used for unmistakably fine, clear and undistorted high-frequency sound reproduction with excellent level stability. All loudspeaker housings are perfectly matched and deliver superior bass foundation, definition and impulse accuracy. The result is a natural and richly textured spatial sound, even at top volume. Particularly impressive is the new 3D sound experience, created by the loudspeakers integrated into the roof pillars and by the use of a special 3D algorithm. A superlative visual performance, too. The borders of the loudspeaker trims are illuminated in white or – in conjunction with optional ambient lighting – a choice of seven colors. Uncompromising in sound and design. PCM – as a basis for Porsche Connect – is your central control unit for audio, navigation and communication. The new generation with online navigation, cell-phone preparation and audio interfaces has a high-resolution 12-inch touchscreen display that can be used for simple control of most vehicle functions. Widgets on the customizable home screen allow you to easily and quickly access the functions that are most important for you. A new feature in combination with the optional 4-zone climate control is an additional touchscreen display in the rear. Passengers can use this to conveniently operate the air conditioning and infotainment functions. During a journey, you can enjoy the wide range of infotainment applications and listen to the radio or your favorite music from the CD/DVD drive, SD cards, internal 10GB hard drive (Jukebox), Aux input or USB connection for your iPod®/iPhone®, for example. The infotainment applications can be operated conveniently using the 12-inch touchscreen display or rotary pushbutton control. It features an LTE telephone module – with SIM card slot – for convenience, excellent reception and optimized voice quality. A wireless Internet access point gives you in-car online access from WLAN-enabled client devices (e.g. laptops, tablets or smartphones), simultaneously if necessary. Our wealth of experience goes back a long way. Since the very beginning, we at Porsche have been dedicated to realizing customer wishes as part of our special request service. Known until 1986 as the Porsche ‘Sonderwunschprogramm’, today we call it Porsche Exclusive Manufacturer. The philosophy has remained the same. Hand on heart. None of this would be possible without originality, inspiration and enthusiasm, beginning as early as the consultation stage. That’s because we keep in mind one thing above all else: your particular wishes and requirements. We fulfill them with composure and meticulous care, through precision handcrafting and the use of exquisite materials such as leather, fine wood or aluminum. And your original car warranty? It will remain completely intact, whichever Tequipment products you ask your your authorized Porsche Dealer to fit. To discover more about Porsche Tequipment, please consult your your authorized Porsche Dealer.